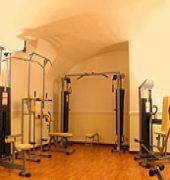 The Hotel is location less than half a mile from Termini Station, Hotel Viminale is a 10 minute walk from the Coliseum. 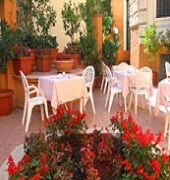 It offers a roof garden with panoramic views of Rome. Housed in a historic building, rooms at Viminale feature classic decor, along with modern facilities such as a minibar, satellite TV and air conditioning. The varied breakfast buffet is available every morning and is served either in the small breakfast room or outside in the courtyard. The bar is open in the evenings. Guests will have easy access to public transportation from Termini Station, where they can get both lines of the Metro and reach every area in Rome. 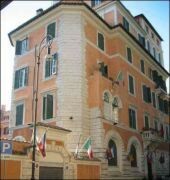 The VIMINALE is a Tourist hotel. Located in City Centre area. Shopping is within walking distance and the nightlife/restaurants are within walking distance from the hotel. 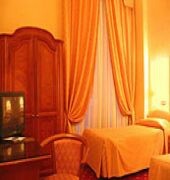 Descriptionclass="small" style="text-align: justify; font-size:11px;">The Hotel is location less than half a mile from Termini Station, Hotel Viminale is a 10 minute walk from the Coliseum. It offers a roof garden with panoramic views of Rome. Housed in a historic building, rooms at Viminale feature classic decor, along with modern facilities such as a minibar, satellite TV and air conditioning. The varied breakfast buffet is available every morning and is served either in the small breakfast room or outside in the courtyard. The bar is open in the evenings. Guests will have easy access to public transportation from Termini Station, where they can get both lines of the Metro and reach every area in Rome. This is my first international review. So it may be skewed a little, but read on! This was our first stop on a school 'field trip'. Rooms were 'old' but clean. Probably needs a coat of paint but otherwise it felt very much like old school charm. Breakfast was fantastic. Staff were helpful and very understanding - and language was not an issue (in case that's a concern). Shower was small. View from the 4th floor balcony was awesome! Location was very good - even though it felt like we were walking down a back alley to get there. All in all it was very good; I would stay here again. Thanks for your kind review, we hope to host you again. We loved our three night stay at this old hotel very near to the Basilica Maggiore and only five minutes from the Terminus train station. It had obviously been a very posh hotel once, and looked like something out of an Agatha Christie novel but we really loved it. The room was very large, the beds were really comfortable, the shower and all the plumbing worked and there was a safe and mini bar in the room. It was a short walk to tram, metro and bus stops and we were able to walk to the hotel on arrival at the Terminus station, having arrived from the Airport on the Leonardo Da Vinci express, and just trundled our small cases through the streets. The breakfasts were filling, consisting of fruit, cereals and pastries. Eat as much as you like, unlimited hot and cold drinks. The only downside was that in spite of the hotel being full, the bar remained closed, but as there were hundreds of lovely bars and cafes within a stones throw of the Hotel, it wasnâ€™t really a problem. We bought a small bottle of milk and put it in the mini bar for our milky night time coffees and morning cuppas. The hotel has two small roof terraces with tables and chairs. Somewhere you could go and take a drink and have a cigarette if like us you need the nicotine! Saw some lovely sunsets and murmerations of thousands of Starlings before they settled down for the evening. I couldnâ€™t tell you what the daily B and B rate for the hotel is, as we had a great deal from Broadway Travel in the UK, flights and hotel costing about Â£150 each for the whole three night stay. Ridiculously cheap and will definitely stay here again given the chance. Loved it! Thanks for your detailed review, we hope to host you again soon. The location is great(!!!) and there are many nice restaurants and bars in the area. 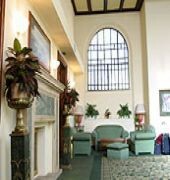 The staff was lovely and helpful, breakfast was sufficient and the room was cute and clean. The little porch in our room was sweet and had a nice view of typical roman buildings. The location is very quiet and I had a fantastic nights sleep. However, the water in the shower takes time to heat(I stayed for 3 nights and everytime i waned to take a shower i had to let it run for a couple of minutes in order to it to get hot enough to get in. one time it took nearly 5 mins. and Wifi connection iwas really bad- in the room and in the lobby and breakfast room as well. other than that- had a lovely experience ! Itâ€™s a quick walk from Termini and near a ton of good restaurants and bars. We only spent one night here but it was memorable. There is a garden balcony on the 5th floor that has an amazing view of a cathedral. The hotel is within walking distance of the pantheon as well. And as it was Valentines day the hotel gave us some prosecco :) a fantastic visit overall. local restaurants within one or two blocks. Stayed at the hotel three different times. Thanks for your kind review and for choosing our hotel everytime you come to Rome.